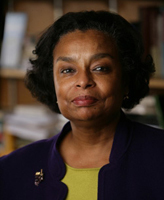 Dianne Pinderhughes, president’s distinguished professor in the departments of Africana studies and political science at the University of Notre Dame, has been named cochair of the new Civic Engagement and Governance Institute launched by the Joint Center for Political and Economic Studies in Washington, D.C. Former mayor of Baltimore Kurt L. Schmoke, dean of Howard University School of Law, is cochair. The Civic Engagement and Governance (CEG) Institute will focus its public policy research and analysis on civic and political participation among people of color in the United States. According to Joint Center President Ralph B. Everett, the new institute aims to connect citizens of color with government institutions so they may better contribute to and benefit from US democracy. “The CEG Institute will project the interests and challenges of these populations into the policy debates in national and regional policymaking arenas,” says Pinderhughes. A faculty fellow of the University’s Kellogg Institute for International Studies, Pinderhughes studies the development of race and civil society in the Americas, focusing on issues of inequality and racial, ethnic, and gendered political participation. She is past president of the American Political Science Association (2007–08). Originally published by Esther Terry at al.nd.edu on February 20, 2012.